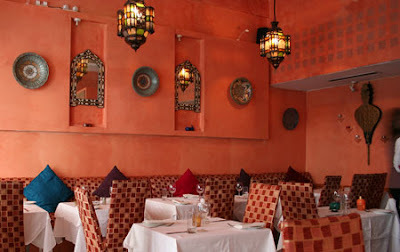 Longing back to sunny North Africa, I and my good friend Per went to Marrakech, the only Moroccan restaurant in Oslo. I experienced a culinary stroll along amnesia lane, as I tucked into a piping hot and tender lamb tagine. Few destinations has left such a mark as Marrakech. Flying down to an old trading centre in North Africa, away from the worst winter in living memory, gave a short but very welcome rendez-vous with summer. I was intrigued by the tastes, sights, sounds, scents, and smells of the Maghreb. Marrakech in Oslo gave a distant echo of this world. There were colourful lamps, ceramic ornaments and rugs looking like the once we saw when exploring the many soukhs in Marrakech. On the bathroom I admired the complicated mosaics that Morocco is so famous for. As we tried to order Harira, the pungent soup from this region, we were informed that they could not serve it. Likewise with the locally produced pastilla. Per ordered Kefte, spiced skewers with ground lamb, and I wanted to taste the local tagine, and we chose the Domaine de Shari, the only Morrocan wine on the menu. We ordered dessert as well, Per a chocolate fondant and I chose vanilla ice and mango sorbet. 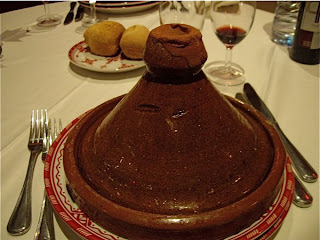 The tagines was less spiced, but the meat was served in a rustic tagine, piping hot, and was exceptionally tender (as it should be). Per was also extremely happy with his kefta. This is absolutely a place to return to for a full review, and for those of you that want Moroccan comfort food, do try it. I asked the proprietor of Restaurant Marrakech whether you could buy tagines anywhere in Oslo. He gave me the following retailer of Moroccan goods. Hi Tor! This definitely sounds like its worth trying. :) I believe I walked by "Marrakesh" awhile back and wondered whether it would be worth a visit someday. Øystein and I enjoyed a cuisine of a different kind last night at our favorite Indian restaurant in Oslo, "Mr India".